The six-CD collection introducing Dr. Estés’ masterwork. If you have any doubt, come join us at the fireside of the Dangerous Old Woman for the soul-healing wisdom that will ignite your creativity and support your highest calling in life—to become a dangerous woman of wisdom yourself. Three decades in the writing, The Dangerous Old Woman presents part one of Dr. Clarissa Pinkola Estés' masterwork. In six “inspire 'til you're on fire” sessions, Dr. Estés animates the archetypal patterns of the Wise Woman through her original stories, poetry, and blessings. Join her in this landmark recording to meet the Dangerous Old Woman from across world history and cultures, including La Anciana, the Ancient One; the Midwife Exemplar; La Tejadora, the Weavers of Fate; the Juggler Women; and many more. We are each born with two forces that give us every lens we need to see who we really are: the wild and ever-young force of imagination that contains intuition and instinct, and the wise elder force of knowledge that holds boundaries and carries the heart of the visionary. 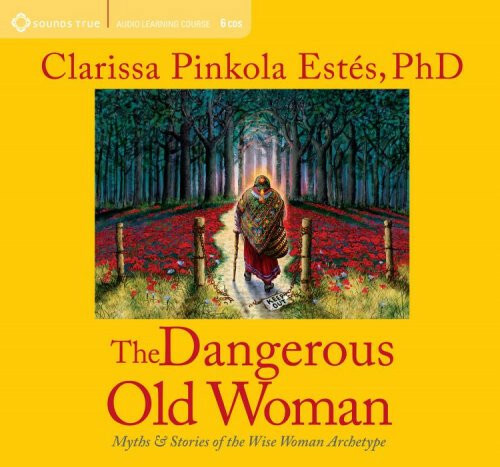 Through captivating stories including “Snow White,” “Las Tres Osas,” and “The Ruby Red Fox,” Dr. Estés illustrates why this twofold way of being “old while young, and young while old” is the secret to holding and replenishing the center, thus living wildly and wisely ensouled amidst life's travails and triumphs. “If you are not free to be who you are, you are not free,” says Dr. Estés. The freedom to be different means one can continue to deepen the work of bringing your one-of-a-kind legacy into the world … by following the trail to that freedom blazed by the Dangerous Old Woman, she who stops at nothing to nourish, protect, and guide us in the offering of all our creative gifts. Clarissa Pinkola Estés, PhD, is an internationally recognized scholar, award-winning poet, diplomate senior Jungian psychoanalyst, and cantadora (keeper of the old stories in the Latina tradition). She is the author of the bestseller Women Who Run With the Wolves and the audio series Mother Night, Seeing in the Dark, and more. She is deputy managing editor and columnist at the political newsblog themoderatevoice.com. She is also a columnist for NCRonline.org, and writes to her readers on Facebook. Her personal blog on culture and creative life can be found at aftermidnightwriter.wordpress.com.